Triggers are used to trigger the execution of jobs. The most common types of triggers are simple triggers and cron triggers. In this article, we will look into simple triggers. In order to schedule a job, we build the trigger and associate it to a job. We use simple trigger if our needs are very basic, for example, if we want to execute the job just once at a specific moment of time or repeat the job execution at a specific interval for certain number of times. A trigger is identified by its key which is a combination of trigger name and group. If a trigger already exists with the same name and group,quartz scheduler will throw exception org.quartz.ObjectAlreadyExistsException. Jobs and triggers can also be placed into ‘groups’, groups help organizing them into categories, for example, high performance jobs or reporting jobs. If we don’t want to categorize then automatically they will be placed into the default group Scheduler.DEFAULT_GROUP. In order to build the trigger use the quartz provided TriggerBuilder class. TriggerBuilder follows domain specific language style and provides a fluent API. It also makes sure that the trigger is updated with reasonable defaults in case certain we haven’t set all the necessary information. For example, if the trigger name is not specified then a unique name will be generated. Below is an example where a trigger is built with minimum information. Here is an example where we even tune its schedule. SimpleTrigger instances execute a job at a specific moment and repeat after a specific interval based schedules which repeat for certain count or indefinitely. 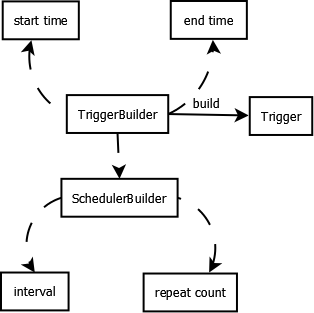 The interval and repeat settings are managed using SimpleScheduleBuilder thus triggers are built using TriggerBuilder for the trigger’s main properties and SimpleScheduleBuilder for the SimpleTrigger specific properties like the interval and repeat count. SimpleTrigger include the following properties. Start Time – The startTime property indicates when the trigger’s schedule first comes into effect. positive long value, and represents a number of milliseconds. Let’s now build couple of triggers. fireAfterEvery5SecondsRepeatThrice() – Starts using current time, fires after an interval of 5 seconds and repeats thrice. fireOnce20SecondsFromNow() – Starts at 20 seconds later from now. Fires only once. Job simply prints the trigger name and decrements the count of the latch, if available. In the example, we create a scheduler and starts it. Next we associate the job with a trigger. We set a latch against the trigger and with each fire the count of the latch is decremented. Once all the triggers are fired, we then try with our next trigger. 17:40| INFO | QuartzScheduler.java 240 | Quartz Scheduler v.2.2.1 created. 17:40| INFO | RAMJobStore.java 155 | RAMJobStore initialized. 17:40| INFO | QuartzScheduler.java 575 | Scheduler DefaultQuartzScheduler_$_NON_CLUSTERED started. 17:41| INFO | QuartzScheduler.java 694 | Scheduler DefaultQuartzScheduler_$_NON_CLUSTERED shutting down. 17:41| INFO | QuartzScheduler.java 613 | Scheduler DefaultQuartzScheduler_$_NON_CLUSTERED paused. 17:41| INFO | QuartzScheduler.java 771 | Scheduler DefaultQuartzScheduler_$_NON_CLUSTERED shutdown complete. This was an example about Quartz SimpleTrigger.